A hilarious and well-crafted story, but somewhat tiresome in its unrelenting hatred and mockery of organized religion (though I must admit, I did chuckle at Croshaw taking the piss out of SDAism with his “Seventh Day Advent Hedge Devolutionists”). 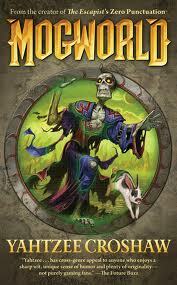 Overall, the tone reminded me a lot of Terry Pratchett’s writing, but was more adult, less satirical and with fewer funny bits. Nonetheless, I am looking forward to reading Croshaw’s next novel, Jam.